The corporate policy of Bremer Lloyd orientates itself on the different and diverse legal systems of those countries, in which our company group is acting. Every employee is responsible to act in accordance with these policies. This applies to all employees at all levels, in every part of the company and in all countries. 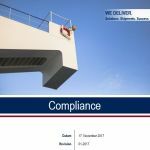 The terms, which we have outlined in our Corporate Compliance Policy, are the basis for actions according to the law and rules. They neither do cover all imaginable situations nor do they describe every valid rules which have to be considered in every individual case. Every supervisor and every employee shall, by his personal integrity, achieve that the Corporate Compliance is lived as an essential part of our corporate culture. Bremer Lloyd expects from all its suppliers and business partners the adherence of the same compliances as well.